Charles Johnson and Mike Vrabel play for the Patriots. But they haven’t always. Johnson was a starting wide receiver in the Fog Bowl. He caught as many passes as Kordell Stewart had pass completions. Andre Hastings led the Steelers with five catches. Maybe the official scorer lost Johnson in the fog. Vrabel was on the wrong end of one of the most infamous playoff moments in Patriot history. Drew Bledsoe was leading the Patriots on a desperation drive at Three Rivers Stadium with his team trailing late in the January 3, 1998 playoff contest, 7-6. As the Patriots neared midfield, Vrabel beat Bruce Armstrong on a blitz, and blasted into Bledsoe’s back. He knocked the ball from Bledsoe, and Jason Gildon recovered to all but seal the Steeler win and advancement to the 1997 AFC title game. Now in 2001, it’s time to reopen the Patriot-Steeler playoff book. This year’s renewal brings a few old familiar foes back, but also blends together a whole bunch of new faces that each head coach will need to get to know in a hurry. The biggest new face of all is Pittsburgh’s new crib. All of New England should boycott any product made by Heinz this week, and that includes their delicious ketchup (speaking of that, why does Hunt’s spell it “catsup”?). Massachusetts residents should completely disavow the junior senator of the Commonwealth for this week also. Heinz Field will give the Patriots a little glimpse of what they’re in for next season. The football replacement for Three Rivers Stadium is quite nice (CMGi will blow this place away, though), though the nomenclature is a little wacky. Instead of being the grand palace of Steeler Football, as well as the living symbol of the legacies of Art Rooney and the Steel Curtain, people refer to this place as the Big Ketchup Bottle. I’m not quite sure that Mean Joe Greene or Jack Lambert are real cool with that. Ironically, they even have a player named Hines. 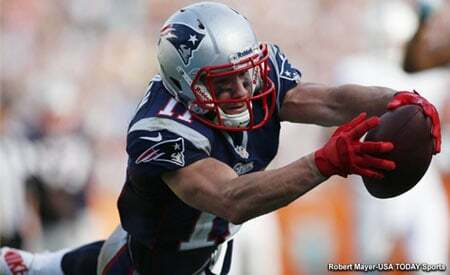 By next Sunday, Patriot Nation will get to know this guy a lot better than a common hot dog condiment. The Patriots and Steelers bring a nice little playoff legacy to this Sunday’s clash for the right to advance to Super Bowl XXXVI. Given how each team’s season has gone, it will make for an interesting matchup. The Steelers are the most complete team in the AFC, while the Patriots are the hottest and the luckiest team. Finding out whichever means more will be six more days in waiting. If either of the previous two playoff tilts between the two teams has any bearing on the game, expect a classic contest. The Patriots have a history with such key players as Stewart, Jerome Bettis, Gildon, Earl Holmes and Chad Scott. There are a lot of new wrinkles to learn about the Steelers, but Bill Belichick and his staff have proved that they are more than equal to the task from a preparation standpoint. In reality, the Fog Bowl of 1996 and the Fatal Fumble of 1997 have no bearing on this Sunday’s AFC Championship Game. These teams are vastly different from their late-1990s incarnations. In many ways, both teams are markedly better. But the reality is that the Patriots are 1-1 against the Steelers in postseason play, and should have been 2-0 if not for injuries to key Patriot offensive players. The Fog Bowl, played on January 5, 1997, has been listed among the best games in Foxborough Stadium history. The Patriots blasted the Steelers off the map, 28-3, thanks to a first half that ranks among one of the finest in team history. Like Saturday night, weather was a problem in that a dense fog enveloped the stadium, and made television coverage next to impossible. But the game went on as usual, and the fog did not seem to alter the game that greatly. At least the Patriots didn’t seem bothered. You didn’t need a clear day to stop the Steeler running attack, as Bettis was suffering from a groin pull. Bettis was limited to 43 yards on 13 carries in scant duty. The Patriots covered him like a blanket. By the way, it’s now January of 2002 and nothing has changed with Bettis. He has groin problems and has missed the last six games, including Sunday’s playoff win over Baltimore. Fog? On the Patriots’ first play from scrimmage, Bledsoe let fly with a deep right sideline bomb to Terry Glenn. He beat Rod Woodson by a step, and hauled in a 53-yard completion. On the next play, Curtis Martin ran it in from 4 yards out and it was 7-0 Patriots quicker that you could spell Transylvania. Fog? On their second possession, Bledsoe dropped back, let the pass rush surround him, then dumped off a nice little screen to Keith Byars in the right flat. Byars ran 34 yards to the house. Or rather, he simply disappeared in the fog. It was 14-0 Patriots, and the Steelers wondered what sledgehammer had just hit them. Early in the second quarter, the Patriots began a drive at their own 22. Bledsoe handed off to Martin, who headed towards right tackle. He made a cutback inside, and ran right by Carnell Lake. 78 yards later, Martin stopped running. It’s 21-0 Patriots, and the Steelers were dead for all intents and purposes. Bledsoe cooled off from that point on, playing a mediocre rest of the game. The Patriots did get a 23-yard run from Martin for the final Patriot touchdown in the fourth quarter. A foolish Bledsoe pass which was picked off by Chad Brown led to a 29-yard Norm Johnson field goal for the only Steeler score of the game. Despite all this offense, the defense was the real story of the game. Shutting down the injured Bettis was nice but wasn’t too hard to do. But putting the shackles on the Steeler passing attack was critical, and this was the real key to winning. Stewart came in and relieved starter Mike Tomczak, and went 0 for 10 passing. Tomczak would come back into the game later, but threw second half interceptions to Lawyer Milloy and Willie Clay. Johnson was the top Steeler receiver back then, but was shut out against the Patriots that day. Pittsburgh was beaten up in every way possible. When the two teams met the following year in the AFC Divisional round (the Fog Bowl was also in that round), the Steelers figured to exact sweet revenge on the Patriots. Instead, by a cruel twist of fate, sweet revenge was exacted a few weeks prior to this playoff rematch. During a regular season clash between the two teams on December 13, 1997, the Patriots nursed a 21-13 lead as the game neared the two-minute mark in the fourth quarter. Bledsoe was trying to drive the Patriots and chew up clock, and the Patriots had forced the Steelers to use up all their timeouts. They were faced with a third down and six, with just over two minutes to play. Rather than play it safe by running and punting the ball back to Pittsburgh, trailing by 8 with no timeouts left, Bledsoe decided to gamble and make the first down. He dropped back and tried to hit Dave Meggett in the left flat with a screen pass. What Bledsoe didn’t see was that right defensive end Kevin Henry hung back in coverage, and wasn’t rushing Bledsoe. Bledsoe never saw Henry as he let the soft toss fly towards Meggett. Henry stepped up and caught the worst pass of Bledsoe’s career, and returned it deep into Patriot territory. It set up a game-tying touchdown/two-point conversion, and the Steelers would prevail in overtime. The Steeler win in this game meant that the ensuing playoff game would be played in Pittsburgh and not Foxborough. With this game on the road, the Patriots figured to be easy marks for the Steelers. Instead, the Patriots were the ones with revenge on their minds for the Henry pick, and the game turned into one of the classic defensive tussles in Patriot history. Belichick was defensive backs coach for the Fog Bowl. But a man who never got enough credit for the great job he did in Foxborough was 1997’s defensive coordinator Steve Sidwell. Together with defensive-minded head coach Pete Carroll, they built a defense that was actually tougher and stingier than 1996’s. It was the heyday for players like Ted Johnson, Ty Law, Todd Collins, Willie McGinest and Milloy. The Patriot defense yielded only 10 points in two postseason games in 1997. Sidwell’s unit shellacked Stewart all game long. The Steeler quarterback completed only 14 of 31 passes for 134 yards and one interception. But one play in the game proved decisive, and that was a 40-yard run around left end in the first quarter for the Steelers’ only score. Collins could not keep containment, but Jimmy Hitchcock was clipped on the play, and the clip sprang Stewart. This one touchdown stood up. Both Martin and Coates missed the game due to injuries. The Patriots’ leading rusher was Sedrick Shaw, with a 10-carry, 22-yard performance that was indicative of the career of the wasted compensation pick for Bill Parcells. Bledsoe fared a little better than Stewart, but had to throw more often due to no running game at all (23 of 44 for 264 yards, two picks). Shawn Jefferson led the team with nine receptions; Glenn had five, Troy Brown one. All the Patriots could muster for scoring were Adam Vinatieri field goals of 31 and 46 yards. The Patriots were unable to dent the Steeler defense with their depleted offensive corps, and Vrabel’s stripping of the ball from Bledsoe in the game’s closing minutes sealed the deal. Bledsoe did get the ball back with seconds left, but failed to get the ball into Vinatieri’s range for a game-winning field goal as time expired. The one unifying element that Patriot Nation can take from these two games is that the Steelers can be shut down. The Patriots yielded only ten points in the two games to the Steelers. Holding the Steelers to seven points in Three Rivers Stadium should have been plenty enough to win. The Patriots held the Steelers to only nine points in their last meeting to date (December 6, 1998, also at Three Rivers), and broken-fingered Bledsoe had just enough to put 23 points on the board and deliver a victory for the Patriots. Does any of this mean anything this weekend? Once again, examine those who still remain. Bill Cowher still leads the Black and Gold, and the less television time his wife Kay gets from her private box, the better. Stewart seems more mature today, but Patriot Nation may still view this guy as nothing more than a punk. Bettis is once again suffering from groin injuries. Gildon and Holmes form half of one of the best linebacker corps in the league. Scott is being viewed as a possible target for Tom Brady to pick on. The Steelers are improved in the areas in which they were very good at five years ago. They are first in the NFL in both total defense and against the run. They are eighth against the pass. The Patriots don’t measure up when you talk about raw yards allowed. But the teams measure up in points allowed. The Steelers are third in points allowed, the Patriots sixth. The Patriots may just want to let the Steelers run and throw between the 20s, then let Kris Brown, the biggest glaring weakness on this team, go out there and hopefully shank three or four easy field goals. It will keep the score down, and give the offense a chance to dent the Steeler secondary. Many NFL experts perhaps think the Steelers win easy. They tore apart the defending Super Bowl champs, that was obvious. But Baltimore played totally flat and uninspired on Sunday, which is remarkable and unbelievable given the division rivalry between the two teams. The Patriots will not come out flat against Pittsburgh, and ought to be thankful that no bye week will come into play for this game. The Patriots and Steelers will play a great game Sunday. Period. And Stewart had better be more grown up than five years ago. Hopefully, it won’t matter. Belichick is busy at work figuring out how to defense Stewart, which should make the mercurial Steeler quarterback a little uneasy. Meanwhile, Patriot Nation will sit back and listen to a nation that doesn’t believe in them for still another week. And leave that Heinz ketchup in the fridge, where it belongs. This entry was posted in Uncategorized on January 22, 2002 by Bob George.